Bräcke Mölla is a fully functional smock mill. It stands on the hill Bräcke near the small town Lerhamn, around 5 kilometers south-east of Mölle on the Kullen Peninsula. Bräcke Mölla stands on a bricked rubble stone base with an encircling gallery. From there the cap with the wings and the brake can be controlled. 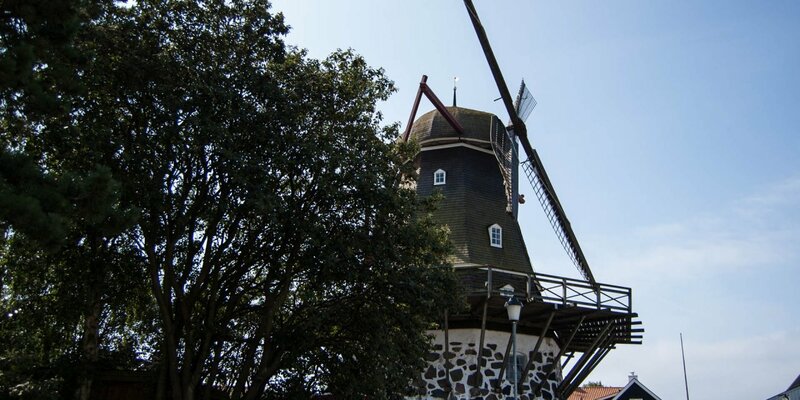 The mill has a total height of 18 meters and a wingspan of also 18 meters. With ideal wind conditions it is possible to grind about 500 to 600 kg of flour per hour. The mill belongs to the heritage society Kullen, which puts them at in operation on several days in summer. More visiting dates are available by appointment. You also have the chance that you encounter a members of the heritage society at the mill, so you are allowed to take a look inside. Today the mill is a kind of a newcomer with a troubled past. It originally comes from Småland and is at its present location just since 1980. The originally mill burned down in 1946 and the place on the hill remained deserted for decades. The Bracke Mölla was originally built by a Dutch mill constructor in 1850 in Värnamo in Småland. After just a few years the forest around the mill had grown so dense and high that the mill was not getting enough wind for effective operation anymore. 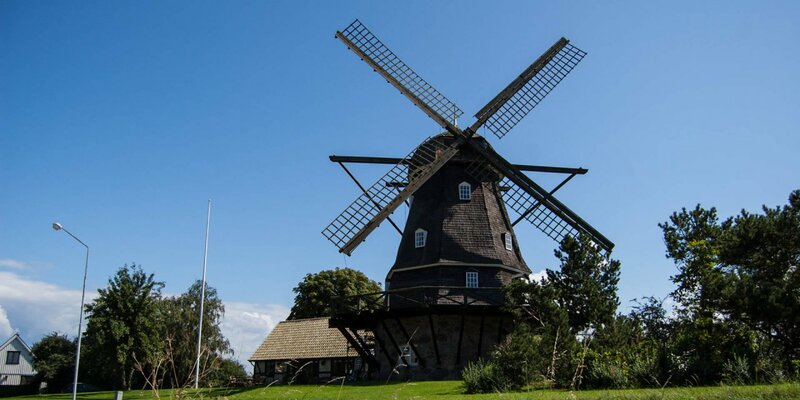 It was sold to two millers in Helsingborg, dismantled piece by piece on site and rebuilt in Helsingborg in 1860. There it was in operation until the end of the 1940s. 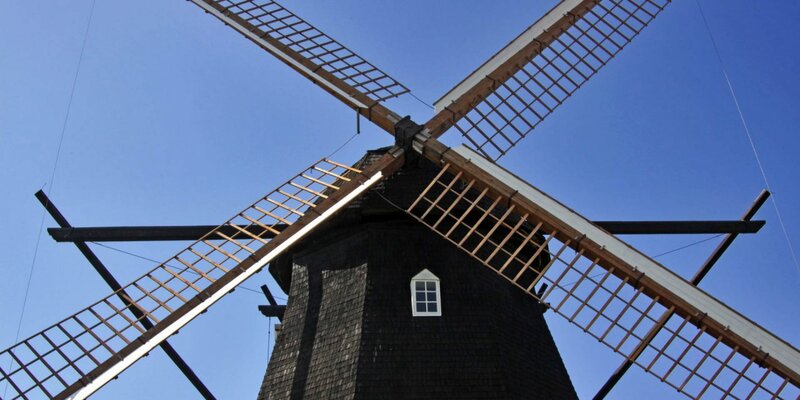 After a winter storm had destroyed the wings, it was decided not to repair the mill again. When the municipality wanted to demolish the decayed mill in 1970, the heritage society Kullen announced their interest in the mill. 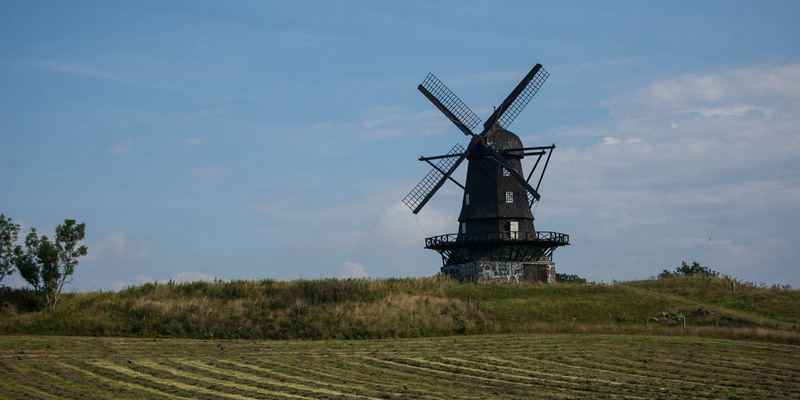 The association received 100,000 crowns from the municipality of Helsingborg for the removal of the mill. Another 100,000 crowns from the Höganäs municipality and 10,000 crowns made by donations were for the restoration. The mill was disassembled into two major parts, transported by sea from Helsingborg to Höganäs and placed on her new brick basement early in 1980. After thousands of hours of volunteer work, the mill is now fully functional again.